Everything went back together just fine after receiving the new timing chain cover and pressing in the new seal. The motor fired right up! 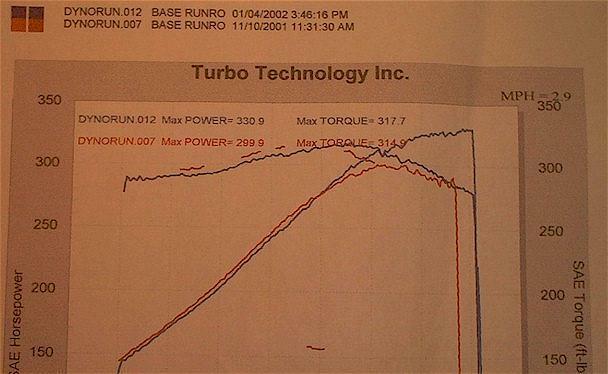 After doing an idle re-learn and tweaking the MAFT to richen the A/F mixture a bit since it appeared to be running a little leaner after the cam and intake installation I dynoed the car again at Turbo Technology Inc . This run represents an increase of 31 RWHP and 3 RWTQ from the last dyno session so overall since the motor was first installed I have picked up 44 RWHP and 18 RWTQ without touching the stock exhaust system! The new total RWHP of 331 equates about 390 flywheel HP so I think you can tell what needs to be improved next (EXHAUST!). I spent all of about 20 minutes connecting the wires to the neutral safety switch on the clutch pedal. I'm not sure why I waited so long to do this but it's complete now and works just like it's supposed to! I should have taken a picture while I had everything apart but I forgot so I tried to take one with all of the steering column wiring re-installed. 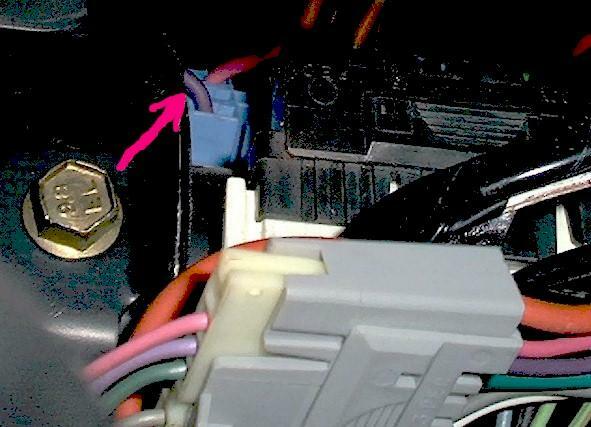 It's a bit dark and blurred but your can see that the necessary wire to splice into (denoted by the red arrow) is the thick 12 gauge purple wire which comes out of the blue connector attached to the topside of the steering column ignition switch. This wire goes to the starter solenoid and is labeled 3PPL in the Monte Carlo Service Manual.